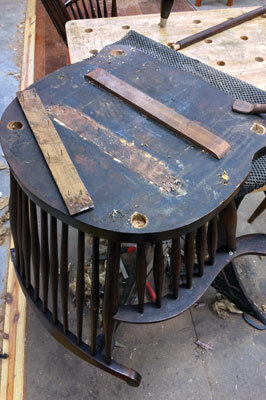 Recently, a client brought us some chairs that were badly in need of repair. They were a wedding gift to her parents in the 1930s. The chairs weren't priceless antiques, but they were very special to the client. I agreed to fix them as it seemed they just needed a little TLC. Upon further inspection, someone had obviously attempted to repair the chairs previously. 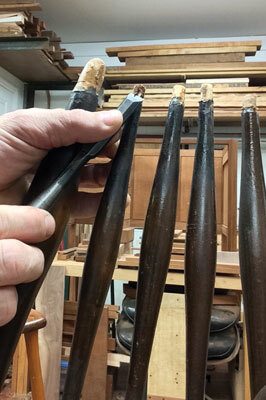 The seats had separated on their joints and most of the spindles were loose due to glue failure. This happens, but how they were 'fixed' was questionable at best. I can't blame the person who fixed them; maybe they didn't know any better. This brings up the idea of knowing your craftsman. We've all heard of 'knowing your farmer' but why not knowing your craftsman? There is an issue of trust when it comes to dealing with objects of value. Whether it's monetary value or sentimental value, we should treat the objects with respect. The best way to respect these objects is to preserve their integrity. We all know chairs are abused, intentionally or not, it happens. People flop down in them, rock them back on their rear legs and drag them across the floor, and so on. A chair maker knows this and should build and repair accordingly, but there are limits as to what he or she can do. The level of care is ultimately up to the owner. As a result of normal wear and tear, these pieces have a lifespan. Hopefully, as in this case, the adhesive fails first, then joints loosen and glue fails. What happens after that is what I'd like to focus on and how I approached the repair of these chairs. The first step is a close inspection. 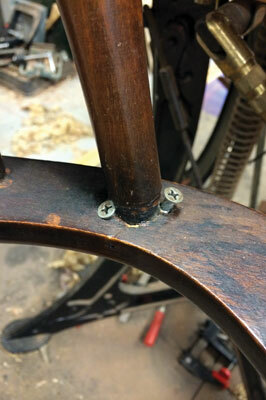 In this case, the cross-bracing was glued and nailed to the bottom of the seat in an attempt to stop the seat from separating. 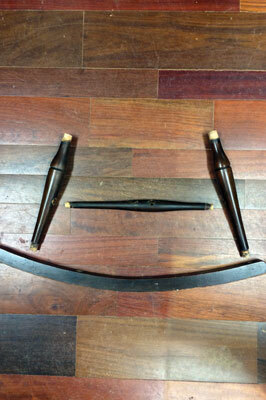 The unintended results were the worsening and continued cracking of the seat joints. It's possible the original repairer didn't understand wood movement. They shoved wedges, putty and glue into the cracks. A proper fix will consist of disassembling the joints, cleaning off old glue and, if possible, regluing the original joint. If battens on the underside are the only option, be sure to use slotted countersunk holes with screws to allow for seasonal movement. 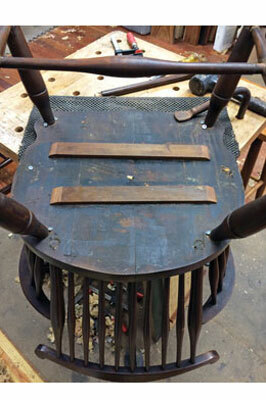 In these chairs, the joinery consists of round tenons mating into round mortises for the leg-to-seat joinery. In nearly all of these, the glue had failed. There was some attempt to glue them back as I discovered dried glue pooled around the base of the spindles. Even worse, some of the more critical joints - for example, the legs-to-seat joints - were reinforced with screws driven in at an angle, sometimes hidden with putty, sometimes not. There were also several instances where nails were driven in in an attempt to fasten them further. Of course, this didn't provide a long term solution. When I disassembled the joints, I found old, dried glue in the bottom of the mortises preventing a complete seating of the joints. I carefully drilled out the mortises to remove the old dried glue. I also removed the old glue on the tenons with a chisel and card scraper. Gel stripper also works well to loosen the old glue. The mating surfaces should be clean and free of dirt, wax and old glue to ensure a good bond when re-gluing. In the case where disassembly isn't possible, you can drill a tiny hole that enters the mortise, large enough for a syringe where glue can be injected to sure up a joint. If at all possible, a complete disassembly and re-gluing is preferred. 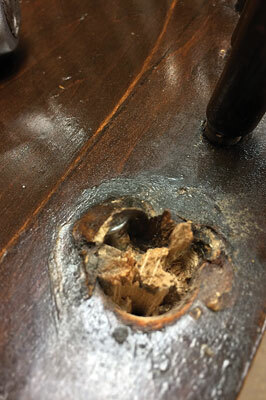 When choosing a glue to repair joinery, there are several things to consider. How likely is it that this piece will need repairing in the future? In the case of chairs, it's pretty likely. Using epoxy, or polyurethane glue might sound tempting as both of these adhesives are strong, gap-filling and moisture resistant. That being said, they likely won't be an easy repair for the next person. I suggest the proper repair as discussed earlier, and using hide glue. Hide glue is traditional, time-tested glue used in furniture and instrument making. Liquid hide glue is available from your hardware store and ready to use out of the bottle, no glue pot required. One of the many benefits of using hide glue is that it is reversible. It is also non-toxic and very strong. With a wet cloth and heat from an iron, hide glue can quickly and easily be reversed, allowing for joints to be disassembled. Hide glue should be a consideration for new builds as well, as hopefully our pieces will be around long enough to need repairing. The biggest tool you'll need is patience to do the right repair this time round so that the next repair isn't as painful for the next person. Taking these extra steps ensures a long lifespan for the piece and more years for it to be enjoyed, as intended by its maker.